There are many potential causes of sacroiliac pain including injury, degeneration, pregnancy, mindbody interactions and diseases. The SI joint is incredibly tough and durable, yet is still susceptible to suffering structural damage from a wide range of possible sources. However, it should be noted that many anatomical changes in the sacroiliac are not painful or pathological in any way. Therefore, patients and care providers are both cautioned about linking expected age and activity-related changes to expressions of pain without verified evidence of a causative process. Since there are many specific causes of SI joint symptoms, and because these possible causative circumstances often overlap within the same patient, diagnosis of the condition is just the first step in successful treatment. Isolating the exact causative factors that are responsible for the pain is a completely different challenge, but is a crucial step in order to provide the best therapeutic interventions for each patient. 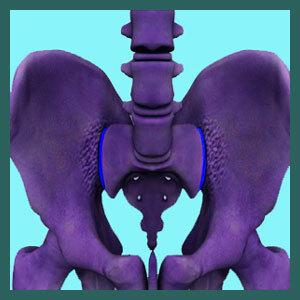 This important resource section profiles the various possible causes of sacroiliac joint pain. We will examine the most common sources of SI symptoms, as well as some lesser seen contributing circumstances. There is no single universal cause of all SI joint pain problems. In fact, there is actually a myriad of seemingly unrelated issues that might create strikingly similar symptoms in a diverse population of patients. Ironically, the most often cited and most commonly seen contributing factor (osteoarthritis) is rarely the actual culprit for pain. It is merely a normal part of skeletal aging and is often observed innocently residing in the SI joint after the age of 40. Meanwhile, some of the more obscure potential causes of pain have much greater chances of actually being the root origin of symptoms, when they are discovered and correctly attributed to the causative condition. It is a 2 part challenge to undergo a proper diagnosis of SI joint problems. First, the joint must be isolated as the source of symptoms, then the underlying reason for pain must be ascertained in order to treat the condition using curative modalities. If the true source of pain is not correctly discovered, then the best a patient can hope for is temporary relief via symptomatic care. Sacroiliac injury usually will only occur from severe and focused trauma, such as that enacted by motor vehicle collisions, significant falls and acts of extreme violence. Sporting injuries might also affect the SI joint. Obesity sacroiliac pain is a common consequence of being markedly overweight. Obesity creates many dire health issues in its victims. Pregnancy sacroiliac pain can occur from hormonal changes while carrying the baby or during birth itself. Postural sacroiliac pain might be contributed to by different leg lengths, sacrum misalignment, scoliosis or functional issues that create poor anatomical form. Sacroiliac pain from different leg lengths can be further divided into structural and functional case profiles. Foot pronation sacroiliac pain is a controversial theory that suggests specific postural changes have occurred and are now affecting the SI joint. What causes sacroiliac pain? The answers to this common question might surprise many of you and particularly those who have received a structural diagnosis, yet have not responded well to treatment. Sacroiliac infection can cause sacroiliitis and pain from some forms of local and systemic contamination. Sacroiliac fracture is very uncommon, but does explain pain in a minority of affected patients. Mechanical sacroiliac pain is reported to occur in patients with greater degrees of joint movement. Sacroiliac instability is a direct result of structural deterioration of the joint structure or the supportive connective tissues, such as in the example of hypermobility. Colitis, Crohn’s disease and sacroiliac pain seem like conditions that should not be related, yet they are found together in many patients. Brucellosis sacroiliac joint pain can occur in conjunction with infection of bacterial substances that are orally ingested. Congenital sacroiliac joint problems might run in the family line, disposing some people towards the development of pain as they get older. Sacroiliac scar tissue may result from injury or surgery and is a leading source of diagnosed pain. Sacroiliac pain from muscle imbalances may occur when one or more of the many soft tissues which attach to the sacrum and pelvis fall out of balance and create functional problems in the greater SI joint region. Sacroiliac pain after spinal fusion occurs in about 80% of postoperative patients within 5 years after their surgery. Our proprietary pain relief program can cure pain from many sources of sacroiliac suffering and manage pain from the rest. You can get help immediately, since our program is fully available online 24/7. Most patients will demonstrate more than one possible cause of SI joint pain, once the area has been focused upon as the primary source of discomfort. Many patients have a history of poor posture, pregnancy or contributory disease, while virtually all will be able to recount examples of injury that might have played a role in the current symptomatic expression. SI degeneration is universally experienced in adults, adding another possible overlapping causation in virtually all patients. Since structural deterioration from normal osteoarthritis is virtually never the cause of SI joint pain, and many other case-specific possible contributors might also be incidental, discovering the true mechanism of symptomology can be challenging. Therefore, each patient should receive a comprehensive diagnostic evaluation, including all possible causative and contributory scenarios that might explain SI pain. If you are interested in learning more about a very common and often overlooked cause of sacroiliac pain, then please continue onwards to enjoy our section covering the mindbody role of causation in SI joint concerns.